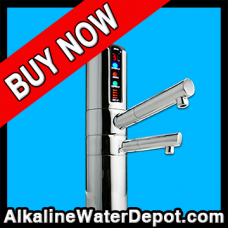 You want two things primarily from an ionizer: clean and healthy water. The Delphi delivers both, using the latest Emco Tech technology. Secondary considerations in performance are durability - or how long will the unit perform, and functionality. If you'd like to understand the science behind the Delphi then go to: The Basics of How an Ionizer Works to find out more. The Delphi employs the revolutionary BioStone Filtration System. The BioStone is the most advanced ionization filter available today incorporating Granulated Activated Carbon, calcium and BioCeramic Tourmaline providing you the highest level of filtration and the latest in technology. Emco Tech is the #1 manufacturer of water cell technology in the world. The Delphi offers you the absolute zenith of cutting edge electrode technology. The Delphi employs the new "mesh electrode" which effectively increases surface area and ionizing power without the large voltages required to run larger plates. This technological advancement increases efficiency while protecting the electrode life. When a cross section of a mesh electrode is examined under magnification, you can see that the electrodes are now covered in a super fine mesh with very distinct points and valleys. They are also electro-plated platinum titanium, providing the highest level of conductivity and durability. The cutting edge design ensures you get the best ORP alteration year in, year out. The new mesh allows for its compact size. Do not be fooled by those manufacturers who claim that a large plate size is the key to ionization. It generally indicates less advanced and sophisticated technology. Research shows that the ideal level for drinking alkaline water is between pH 8.5 - pH 9.5 with an ORP of -250mv. It is unimportant if an ionizer creates big -ORP numbers at really high levels of pH. Water over a pH 10 begins to acquire an unpleasant taste due to the heavy concentration of minerals. What is important is drinking water at the ideal alkaline levels of pH 8.5 - pH 9.5 with good -ORP. Of course the Delphi will create the big -ORP numbers at the higher pH ranges, but it is designed to give you the best ORP at the lower levels of pH. The levels that you will actually enjoy drinking. This new system completely eliminates the mineral scaling from the electrodes ensuring you will have many long years of healthy water. With other ionizers, you have to wait during a reverse polarity cleanse to use the ionizer. The DARC system cleans as you ionize - so you never have to wait for a cleaning cycle to complete. You never have to give cleaning a thought! You will also want your ionizer company to be around to take care of your needs many years after you make the purchase. This point can not be emphasized enough. In the last three years alone, approximately 8 new manufacturers have come and gone in the market. With Emco Tech you buy with absolute certainty that your company will be around to support you - long after the other Johnny-come-latelys have left some people high and dry. Emco Tech's combined 35 years of experience and track record is unmatched. Period. Convenience and utility are two primary components of functionality in an ionizer. The Delphi is tops in these categories as well! The Delphi was designed from the start as an undersink unit. It has two components: a state of the art undersink ionizing unit and an elegantly designed sink-side faucet. The Delphi is easier to use than all other ionizers. A light touch with one finger on the control pad on the top of the faucet selects the type of water you want. The elegant faucet has a beautiful LCD display which shows the type of water level and ionizing power you have selected. It also displays the filter life - reminding you when its time to change the filter. The faucet also allows you to get both streams of water - alkaline and acidic - right at the sink. You can rest assured that the Emco Tech Delphi provides you top filtration and ionizing performance with ultimate convenience. The most advanced mesh platinum-titanium electrodes in the world - backed by Emco Tech's reputation. Will completely eliminate mineral scaling from the ever important electrodes - increasing the life of your ionizer. It also means you never have to wait for a cleaning cycle to complete to get a drink. The performance of functionality of dual filtration including the revolutionary 9-stage filtration The BioStone filtration system. The Delphi has an inbuilt flow control valve that automatically controls the water pressure through your ionizer to produce optimum ORP at a selected level of pH. 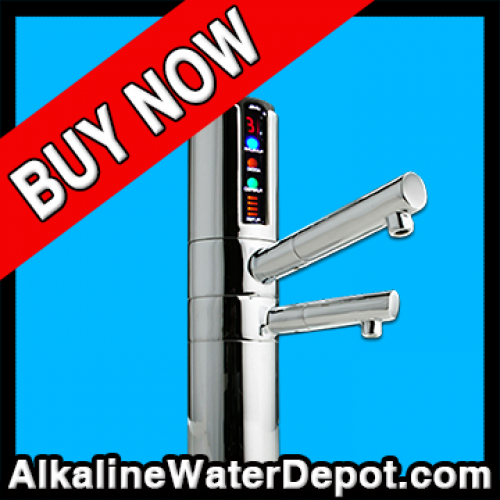 This allows you to add extra calcium to your ionizer. It is important to note that the Delphi is a very strong ionizing unit and will not require the use of extra calcium in most areas of the country. Some areas however have soft water or water that is low in naturally occurring calcium and other dissolved minerals. This feature is intended to boost ionization performance in those areas when necessary. The Delphi employs a thermal switch in the water cell to shut down the ionization process if the temperature in the cell gets too hot. This small but valuable feature gives you peace of mind. The Delphi has a glass tube fuse that will protect the expensive circuitry in case of power fluctuations or surge. The Emco tech Delphi has an LCD indicator which will numerically display the level of ionization you have selected. It also has LCD icons that display the most typical use for a given setting. The Delphi offers you a way to track the filter life - right on the faucet. It counts actual filter use - it is not a timer like on less expensive models. Contains reagent liquid and a pH color chart to help you understand the ionizer's performance and so that you can be sure you are drinking the right level of pH. Your Delphi comes with a short but very informative DVD showing you everything you will need to know to install, optimize and maintain the performance of your ionizer. This beautiful and informative manual makes it all so easy.